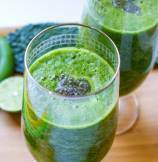 Spicy Greens Smoothie is very low in sugar, high in anti-oxidants and has good immune-boosting nutrients. Chia seeds make this smoothie a good source of omega-3's as well. Specially when weather transitions, this smoothie is my favorite for lunch or breakfast. With good 3-4 servings of vegetables, Spicy Greens Smoothie also has good amount of fiber to keep me full longer. My perfect escape from heavy lunch after heavy family dinner at home or pizza takeout. 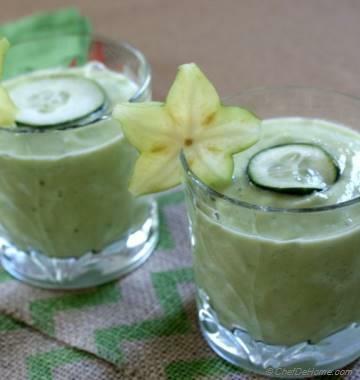 I specially enjoy refreshing taste of cucumber and lime with a little kick of jalapeno at the end. If you do not like spicy, feel free to skip jalapeno or add half green bell pepper for mild spicy smoothie. The other day, I found a booklet in Whole Foods on eating healthy. I am sure you all will agree, we cannot know everything ourselves. Knowledge of any subject is a vast topic and a wise person should keep his eyes and ears open to grasp as much as he/she can. So I never miss opportunity to grab such booklets or articles which can help me cook better at home. And I feel really excited to somehow share it with you all. Long story short, I loved this Healthy Eating Booklet that I found in Whole Foods. And it is free. If you live near-by, go grab one. I found, on many things, like eating healthy salads, meal planning and smoothies, content in this booklet second my opinion. Isn't it great folks? if someone second your opinion and you know you are moving on right path. These little things really motivate me. 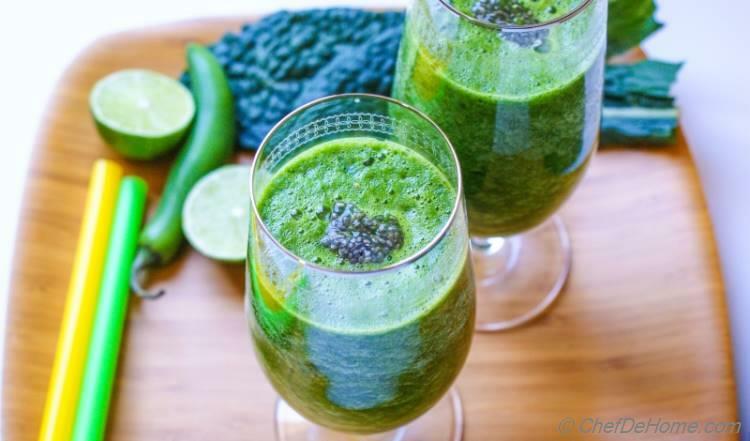 Today, with this Spicy Green Smoothie, I got a perfect opportunity to share some good information about "Healthy Smoothies" from that booklet here. 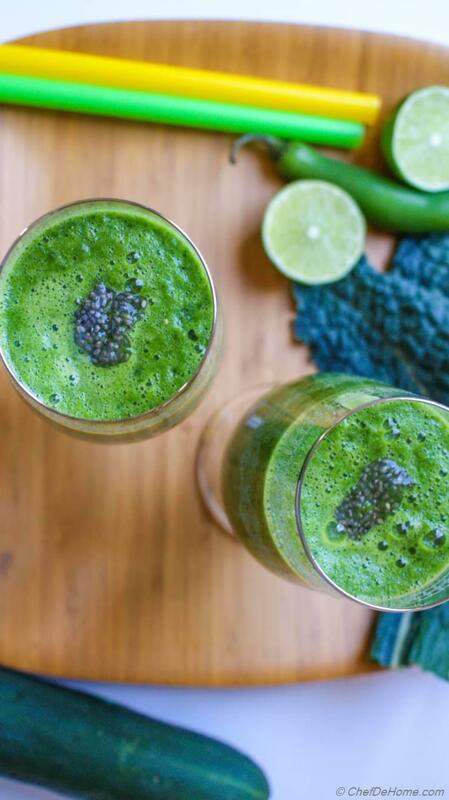 The best 5 rules to make a healthy, immune-booster, fat fighter, blood cleanser yet delicious smoothie. First of all, a healthy smoothie should not be loaded with fat or sugar. This is first rule of thumb. Choose non-fat and non-dairy liquids like most of my smoothies have almond milk or water. What is greater than water to replenish a body the healthy way? Coconut Water (unsweetened), soy milk or almond milk, all make great base for low-calorie smoothie. Or if you have to use dairy, go for non-fat buttermilk or 2% milk at the max. Second, supplement smoothie with 1-2 serving of dark leafy greens like Kale, Spinach, Collards etc for good dose of anti-oxidants and calcium. Third, use fresh or frozen veggies/fruits like cucumber, banana, tomatoes, berries, mango, squash etc to make smoothie taste delicious with abundance of raw fruit fiber. 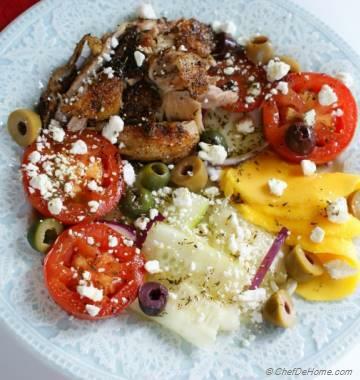 Fourth, add flavorings that boost the taste, immune system yet keeping it healthy for you. Like lime, lemon. ginger, cardamom, nutmeg etc. 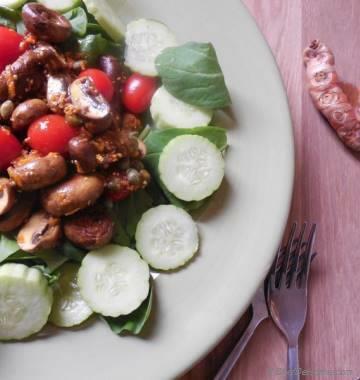 Fifth, add healthy fats (optional) to give your body omega-3 rich good fats to help you combat the bad fats in body. Like Chia seeds, avocado, raw nuts, hemp seeds, flaxseeds etc. Follow these rules and you will never have to second guess your smoothie diet. And you will have endless smoothie combinations to choose from. Smart Swap Add fresh 1" root of turmeric for natural anti-bacterial properties. 1. Soak chia seeds in 1/4 cup water (if using). Now slice all ingredients and using a hand blender or stand blender, blend together all ingredients with additional 1/4 cup water. Pour in glass, top with half of chia seeds in each glass and serve immediately. Thanks for delicious tips. Love to try this smoothie.